Wat Phra Buddhabat is designated one of the top six Thailand Buddhist Temples and is well worth a visit as it is within easy driving distance of Bangkok. 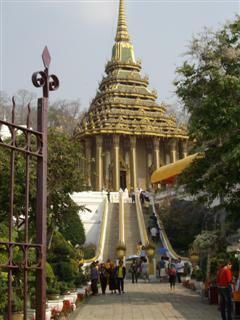 It is located about 190 km to the north of Bangkok in Saraburi Province and about 20 km outside of the town of Lopburi. If you include Lopburi in your trip you can go and see the famous Lopburi monkeys that just roam the streets looking for food. Most of the drive to this famous temple is on the expressway and good local roads so traffic should not be a problem and it is only 2.75 hours drive from Bangkok so it makes a good day trip. Because of the transliteration of Thai to English this Thailand Buddhist Temple is more frequently known as Wat Phra Phutthabat. Follow this link to see the full information on Wat Phra Phutthabat.